Sown with Strength: Made with Strength: I'm ALWAYS the one waiting. 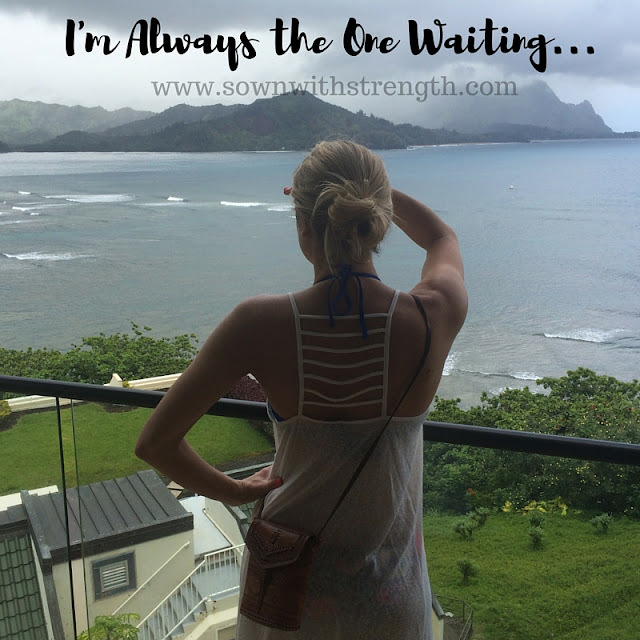 Made with Strength: I'm ALWAYS the one waiting. I have never been patient. I don't like to wait, and yet, that seems to be a COMMON thread weaved in the story He's writing for my life. I saw friend after friend grow up, get boyfriends, fall in love, get married. I starred in countless weddings as a bridesmaid, smiling with my heart because I was genuinely happy for my friends, yet at the end of every wedding night, I was found walking back to my car, away from the party, heels in one hand, and car keys in my other. Heart aching, eyes full of unshed tears. I was alone, and it hurt. God would answer my prayers, he would remember the desires of my heart and ONE day, ONE day I would be the girl in the white dress who stayed. Who wasn't walking to her car with a heavy heart. One Day. Years passed by and I genuinely thought that "one day" never really existed for me. I forced myself to try to date guys I really didn't like that much. I realized my frustration with my singleness and waiting yet again while EVERYONE else around me (or so it felt) coupled off and got married, WAS ACTUALLY NOT IN MY CONTROL!!! Newsflash Courtney... you submitted your life to Jesus, did you not? me- "what was part of that full-life submission?" me- "laying down my life and following Him and His will for my life whatever that might mean"
me- "EXACTLY; so how does MY complaining, getting angry, saying life's not fair, etc etc actually benefit me?!" I was the one ALWAYS the bridesmaid never the bride. Then somehow, I let go. I ACTEd on my choice to lay my life down and take up my cross and follow him. I genuinely settled into my calling where GOD was the One who was leading my steps. I chose to trust in God's ownership of my life. Regardless, of the season of life He saw fit for me to walk through. 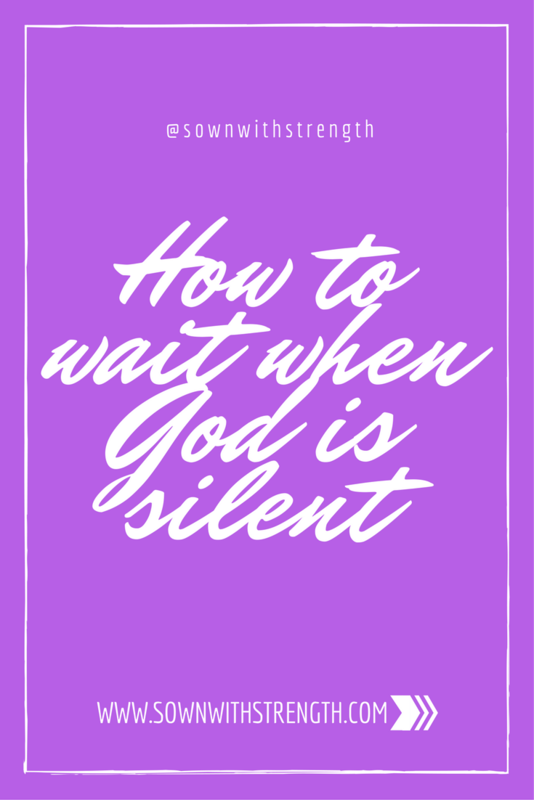 When I did this, I found peace and contentment replaced jealous and frustration as I waited. Singleness taught me to wait WELL. I recall the FAITHFULNESS of my Jesus through storms passed. I recall the PROVISION of my Jesus in the form of my husband. I recall the JOY of my Jesus as I wore white, walking down the aisle as a Bride. I recall the GOODNESS of my Jesus as I learned to trust His heart over my feelings. I recall the PRESENCE of my Jesus as each tear fell and as each frustrated prayer was released. I recall the GENTLENESS of my Jesus as I drew near seeking comfort in His arms. I recall the SWEETNESS of my Jesus as my waiting forced me to know Him more. He transforms ANY season- including the waiting season. Life has a way of moving you through various waiting rooms or stages of life. If you are unable to learn the skill of waiting well, you will never experience the joy of Jesus in the midst of your heartache. He's writing hard into your story for a reason. May His Praise Ever Be On Our Lips. Thank you so much for sharing this! This post spoke to my heart directly! Thank you for sharing this Courtney! It spoke directly to my current situation and my current heart status. I don't know what you are waiting for love in this moment but are in my prayers. Thank you for this nugget of encouragement. Blessings!